As the world's need for high-speed internet grows, there will be an increasing strain on existing infrastructure. While both the internet and the web can create a border-free exchange of data, something still needs to connect continents so that it can be shared. While you will likely never see it with your own eyes, there are actually data cables under the sea which connect large masses of land. Today, Microsoft and Facebook announce a partnership to build a transatlantic subsea data cable. Called 'MAREA', it will connect the United States to Europe. More specifically, it will connect the State of Virginia to the country of Spain. The project will begin this August, with a targeted completion date of October 2017. 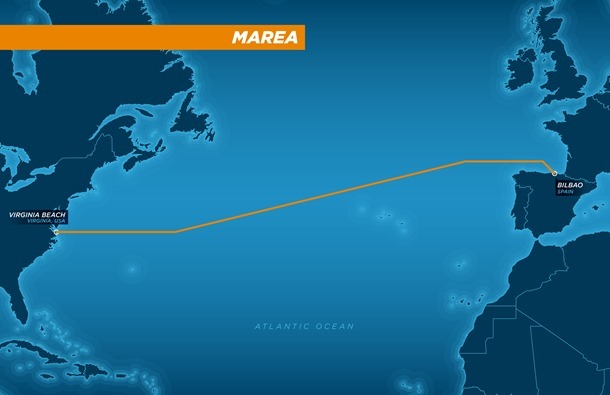 "MAREA will be the highest-capacity subsea cable to ever cross the Atlantic -- featuring eight fiber pairs and an initial estimated design capacity of 160Tbps. The new 6,600 km submarine cable system, to be operated and managed by Telxius, will also be the first to connect the United States to southern Europe: from Virginia Beach, Virginia to Bilbao, Spain and then beyond to network hubs in Europe, Africa, the Middle East and Asia. This route is south of existing transatlantic cable systems that primarily land in the New York/New Jersey region. Being physically separate from these other cables helps ensure more resilient and reliable connections for our customers in the United States, Europe, and beyond", says the Microsoft Server and Cloud Platform Team. The team further says, "Microsoft and Facebook designed MAREA to be interoperable with a variety of networking equipment. This new 'open' design brings significant benefits for customers: lower costs and easier equipment upgrades which leads to faster growth in bandwidth rates since the system can evolve at the pace of optical technology innovation. This is critical to ensure the Microsoft Cloud continuously improves to provide the highest availability and performance our customers need for their mission-critical workloads and data". This cable should deliver better performance and reliability to Microsoft's cloud services. This is becoming increasingly important to the Windows-maker, as it focuses more on that aspect of its business. If you are wondering how Facebook benefits from this data cable, don't forget -- it is the most visited site in the world. The social network can always use increased bandwidth. By sharing the costs and resources with Microsoft, Zuckerberg and company can soften the overall hit to the bottom line. What do you think of the MAREA data cable? Tell me in the comments.